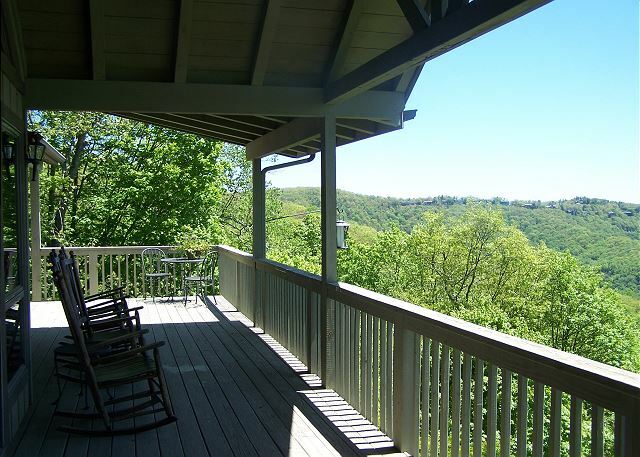 Beautifully furnished, light and spacious 4 bedroom 3 bath retreat located off Hwy 221, just 3 miles from Blowing Rock, The Blue Ridge Parkway and Appalachian Ski Mtn. 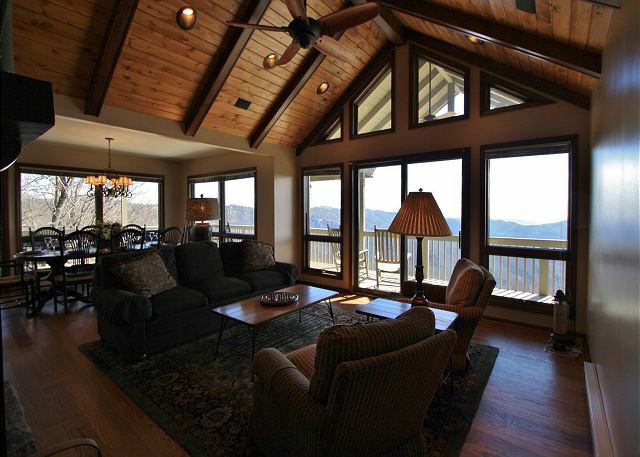 Wonderful layout allows gorgeous views from every room. Cathedral ceiling and a wall of windows in the great room create a postcard effect. 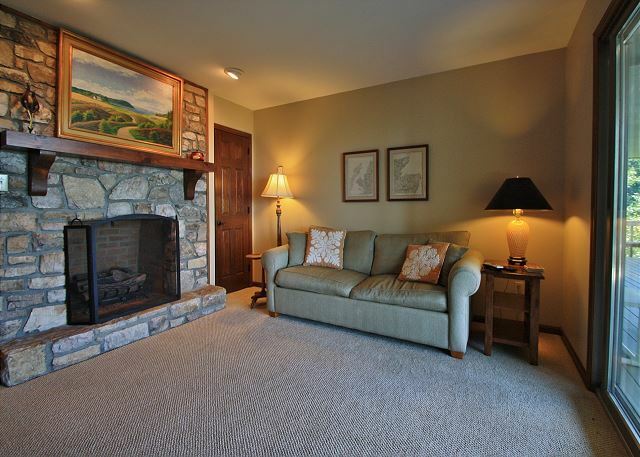 A cozy atmosphere in the living room in front of the stone wood burning fireplace (firewood is not provided), access to covered deck. 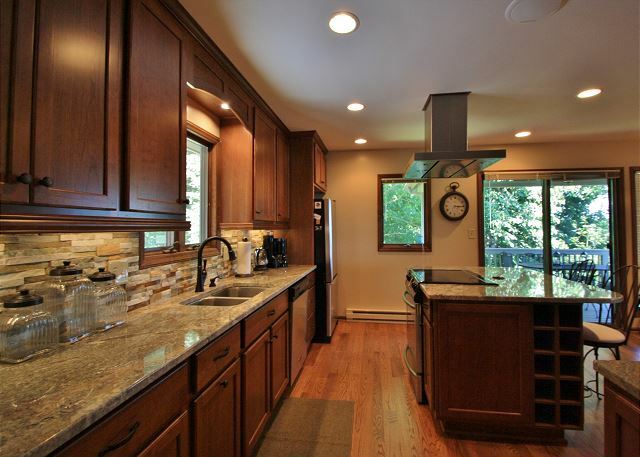 Great kitchen with middle stove island, bar eating for two, dining room table for 8. Wonderful space for creating memorable meals. 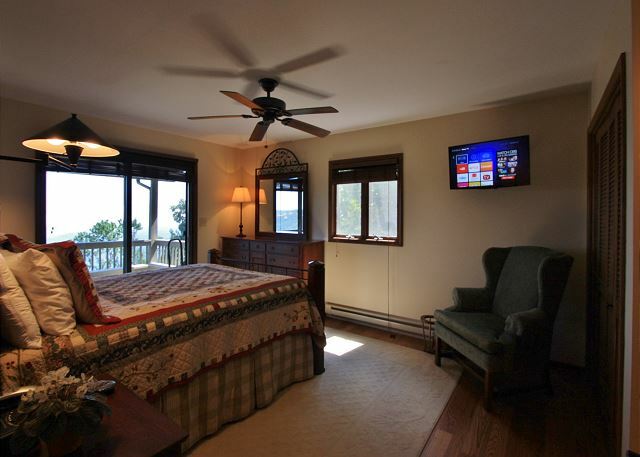 Master bedroom with a queen size bed, private access to the deck, private bath. Level entry to main level. Queen size sleep sofas in the Living room and den on lower level. Guest bedrooms are located downstairs, one with a queen and private bath which has a bathtub/shower unit, one with a bunk bed, trundle, and a den with satellite TV, DVD gas stone fireplace and access to the lower deck. Hall bath with a whirlpool tub & shower stall. Internet. No AC Private paved road access. Four wheel drive required in winter weather. Property maps may not be accurate on 3rd party web sites. Please contact the office directly for exact property locations. Everything we were looking for. Even better than I remembered! 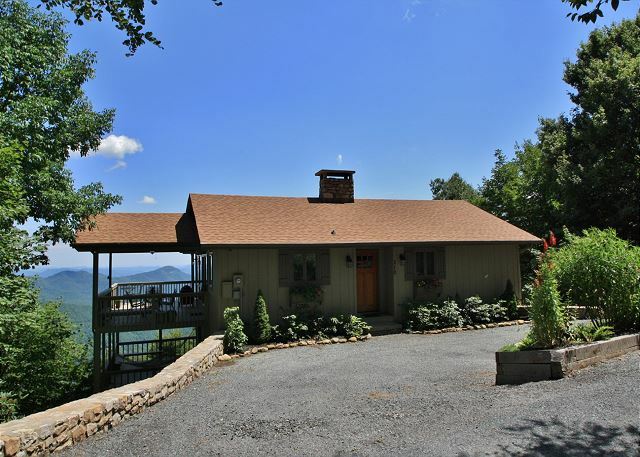 My family has rented houses several times in the Blowing Rock area and this house, by far, is the one everyone liked the most. The views are spectacular, the house is roomy, the kitchen well stocked with plates, pans, implements for cooking etc. It was clean and really beautiful. We will be back! The whole process beginning to end was so easy. Staring a mini-vacation like this should be the norm. Every interaction from Jenkins Rental was so kind and helpful. Because of their professionalism and top notch treatment of their guests I’m going to rent properties from them again. I trust them because of their great care of their business and properties they handle. The cabin very clean and well maintained - I was so pleased. This was our second time at Blissful Vista. The view is fantastic and we plan to come back again next year! By far our favorite place in Blowing Rock. We had an awesome time at Blissful Vista. It was a great place. 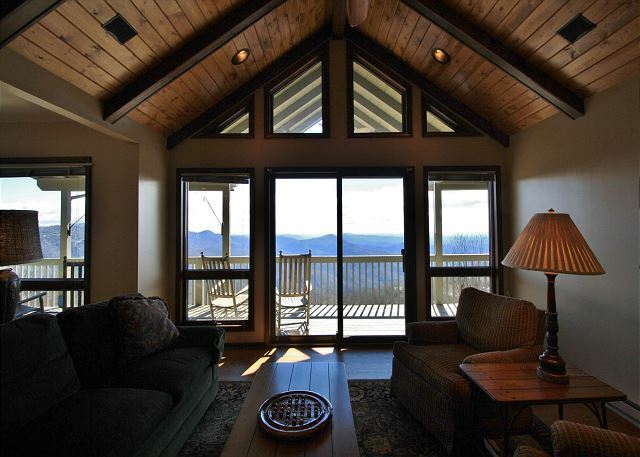 We enjoyed our stay so much that we've already reserved Blissful Vista for next summer. The house is very well appointed and laid out well. The view is great. The only things that were at all not perfect were the trail to the house which is too tight and a blind in the kids room. The fan in the bedroom needs to be tightened. We are going again next year. Thanks for leaving your comments. There are now blinds in the kids room! We look forward to your next visit! We have been coming to Blowing Rock for 2 years in a row for New Years!! We’re delighted within our short stay at Blissful Vista. (Just (9) nine days) but went all the family is having so much fun… days just fly away fast and they become “pleasant reminiscences” The view is far-fetched, just plain gorgeous. The stunning sunrise, birds singing, the fresh air, in touch with nature, just enjoying each other’s company, bonding more as family… playing boards games, cards games and building puzzles. “Beyond price” Just the hole house set up was wonderful, but the kitchen set up and cabinets were just right, it had all the needs for a chef. We want to thank the owner for his outstanding accommodation and Jenkins Rentals for their superb services. This house was very nice and worked well for our weekend needs. 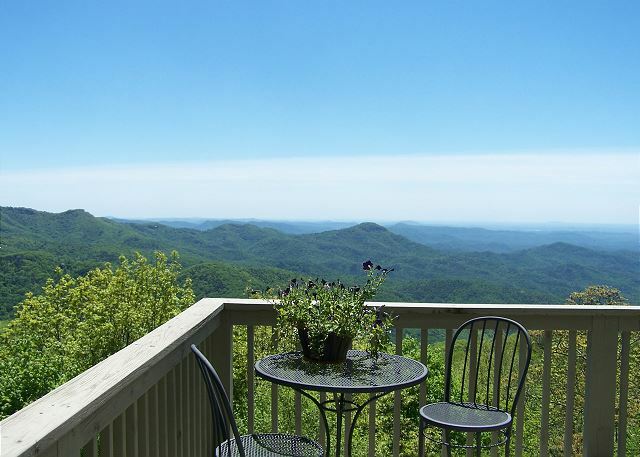 The views were incredible and it was conveniently located for area attractions. The kitchen was well equipped and the decks were wonderful! Please note if TV matters to you, there was no TV in the main living area upstairs. One in up bedroom but not cable. Lower big tv with sat was in very small room. 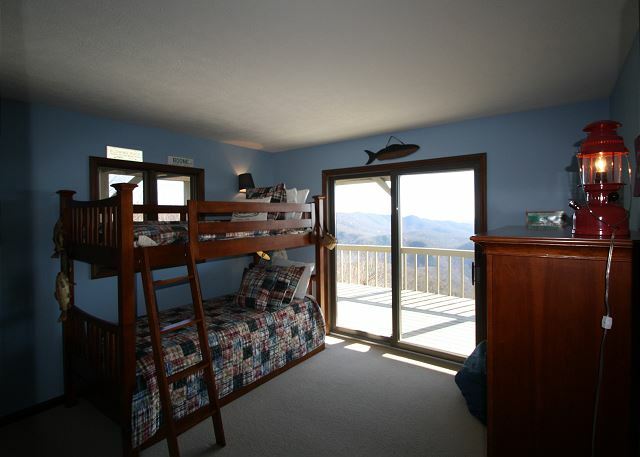 Ideal for four adults and a few children. The beds were great but pull out couch was not good! There are no blinds on any of the lower bedroom windows which are not needed for privacy but you can definitely wake up to great views at early sunrise! Not too good for young children having to nap during the day. Lastly please note only one entrance in and out was front door. Safety concern. Thank you for your review. The TV in the master bedroom is on satellite. The owner has installed blinds in the kids room downstairs. We look forward to your next visit! We loved the home and the views. Everything was in very nice condition. Our only comment was regarding TVs. We traveled with 4 children and 4 adults. 1 tv during our downtown time was difficult. I'd suggest adding 1-2 more tv's to accomodate the needs of families who travel with small children.While we are out doing activities during the day, we would have appreciated a little more privacy for children and adults to wind down and watch movies or sports. Thanks. Thank you for leaving your comments. Not only has the owner added a second TV, but also has given the kitchen a face lift. When you're in the area next, please come back to Blissful Vista.